'The problem is that what he believes to be the truth might not actually be true. He may believe that India needs the Congress, and that the Congress in turn needs the Nehru-Gandhi family, but that does not mean that India shares those articles of faith,' says T V R Shenoy. In 2012 -- not all that long ago, is it? -- the same Sonia Gandhi commissioned the same A K Antony to investigate the Congress's failures in various Vidhan Sabha polls. Who knows on which shelf in the Congress headquarters that is gathering dust? Back then Congress spokespersons argued that local issues carry greater weight in state elections, so no blame fell upon the national leadership. By the same logic, who, or what, should take responsibility for the awful drubbing received by the party in the recent Lok Sabha election, where the Congress could not touch the double-digit mark in a single state? An honest review -- and A K Antony is above all an honest man -- should focus on three specific areas that cost the Congress: Questions about leadership; questions about corruption; and questions about governance (or the lack thereof). I am sorry to say that A K Antony has dropped the ball as badly as butterfingered Indian fielders at Old Trafford. And that he is as reluctant as the BCCI to ask questions about the captaincy. Have I read the 2014 model of the Antony Report? No, it has been seen only by its author and by Sonia Gandhi. So how do we know that questions about Rahul Gandhi's leadership were brushed under the carpet? Antony and I have been friends for over half a century, and I know the man does not tell lies. The problem is that what he believes to be the truth might not actually be true. He may believe that India needs the Congress, and that the Congress in turn needs the Nehru-Gandhi family, but that does not mean that India shares those articles of faith. Students of history agree that a vibrant democracy requires an alternative to the government of the day, which in today's context would mean a party offering Left of Centre options. We can quibble about whether or not the Congress is best suited to fill that space, but realistically there is no other option just now. Does the Congress need the Nehru-Gandhis? That may be based on Antony's own memory of what happened just after the Emergency. The Congress did not rebuild itself after K Brahmananda Reddy, then president, expelled Indira Gandhi, it broke apart. There was a Congress (Indira). There was a Congress (Urs), led by Devraj Urs, which became the Congress (Socialist), led by Sharad Pawar. There was even a Congress (Antony). Both ultimately merged into the Congress-I, Antony's group in 1982, Pawar's in 1986. 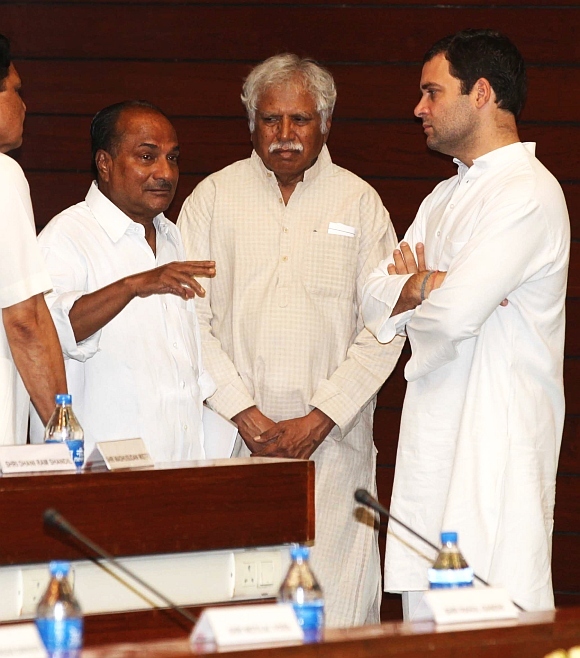 Those years left Antony believing that the Nehru-Gandhi clan is the cement that holds the Congress mosaic together. Questioning Rahul Gandhi shakes this tenet, which means that the Antony Report cannot bring up the issue of leadership. But what of questions of corruption and governance? It may be possible, though difficult, to reclaim land and recover loot. But reversing the damage of the Manmohan Singh years is a greater problem. The 'economist prime minister' sat silently while his party and his ministry went on a tax-and-spend spree, creating a mountain of debt. He failed, spectacularly so, to curb inflation. And he surrendered, tamely, to the fashionable theories patronised by Sonia Gandhi, delaying decisions until the machinery of government ground to a halt. One of Manmohan Singh's legacies is the electricity crisis. Energy sufficiency, we were informed during the debate on civil nuclear cooperation with the United States in 2008, must be a key component of India's security. How did the Congress-led government live up to its own words? Hydropower was opposed by the champagne socialists around Sonia Gandhi because dams may need to be built in the ecologically fragile Himalayas. Thermal power was opposed because coal is a major contributor to atmospheric pollution. Nuclear energy, for which Dr Manmohan Singh risked his government in 2008, was declared unsafe, a campaign that reached a shrill crescendo after the Fukushima disaster in Japan. How was India supposed to meet its energy needs? There was -- still is -- much vague talk of non-conventional sources, particularly solar power. The US Energy Information Administration tells us how the Americans handle the issue. As of 2013, coal accounted for 39%, natural gas for 27%, nuclear plants for 19%, and hydropower for 7% of electricity generated. Solar power generated just 0.23%, less than one quarter of one per cent. All non-conventional sources -- solar, wind, geothermal, bio-mass -- accounted for just 6%. Simply put, it costs too much to generate electricity through solar power. It is viable only if governments pass on the cost to consumers, or if producers are offered massive subsidies (as China does). The first is political suicide, and the second is impossible because the Manmohan Singh years left India with no money. Voters may pardon honest errors in judgment; they shall not forgive deliberate dishonesty. On February 16, 2011 Dr Manmohan Singh was asked about various scandals. He wriggled out by invoking 'coalition dharma'. In other words, Dr Manmohan Singh knew that corruption was rampant but could do nothing about it. How else do you interpret that cowardly phrase? That was not the worst of it. Dr Manmohan Singh could not blame coalition partners for the Coal Scam; the ministry was in the hands of the Congress, and at the time that suspicious allotments were made the coal minister was Dr Manmohan Singh himself. Nor does 'coalition dharma' explain the allegations against the Nehru-Gandhis, from reports about Robert Vadra's land dealings in Haryana and in Rajasthan to the manner in which Sonia Gandhi and her son supposedly grabbed real estate in Delhi in the National Herald case. Leadership of the party is an internal issue for the Congress; the mistakes made by Sonia Gandhi and Dr Manmohan Singh afflict us all. They need to be discussed by the Congress. The Congress has two options. The party can examine itself honestly. Or the Nehru-Gandhi leader of 2019 can commission yet another Antony Report.